Meet Lanre Malaolu the London based director, choreographer and performance artist, Malaolu is making his directorial debut with “Figure” his first short film. Winner of the 2018 ZEALOUS EMERGE PERFORMANCE PRIZE, a nationwide search championing the UK’s best emerging performance artists. He was selected by industry recognized judges including: Akram Khan, Peter Higgin (Punchdrunk) and In-Sook Chapp. In 2016, he was the chosen choreographer for the inaugural OLD VIC 12; a talent group supported by the Old Vic Theatre. He was the choreographer and movement artist on The British Council film ‘DEAR MR. SHAKESPEARE’, which aired on the BBC and was selected for the SUNDANCE FILM FESTIVAL in 2017. Alt managed to grab a few minutes of his time. 1. Why did you did decide on exploring the themes in the film? It’s a subject matter that I have had direct experience with along with many of my peers growing up. It was as much about me wanting to understand and decipher my own feelings and emotions from my father-son experience, while also having a birds-eye view on the overarching message I wanted to convey. 2. Can you tell us about the visual technique what did you want to convey? A sense of inner and outer conflict rooted from an overflow of emotions. In order to find the truth of this for the screen, I did a lot of physical improvisation work as well as allowing space to have honest conversations in rehearsals. 3. Tell us how you got into filmmaking and why you use dance as a means of communicating the mesages in your films? Figure is the first film I’ve directed. I’ve worked quite a bit as an actor in front of the camera, so have always had a bit of insight into the world. As the years went on, I started to experiment with filming dance performances I’d choreographed, but this was the first time I’ve built a project from the ground up as a film. I believe movement provides insight into a deeper emotional place that we as humans all have and feel but words cannot reach. I use the word “movement” as I sometimes feel the word “dance” inhibits the work. We all move, we all speak physically and what interests me is the depths of truth we can unlock and reveal through physicality. Review: A white space, white walls surround two Black men. Silently, excruciatingly, they move. They don’t speak, to us, or to each other; they dance through the empty space, and themselves. They touch, they embrace, they fight, they reach one another and then they push each other away. They exercise, they read, they almost metaphorically die a little bit, strangled by a thick rope. Figure is the new 5-minute-long work of art of one of the most interesting UK creative minds: bring us another intense, poignant and visually striking work of art. 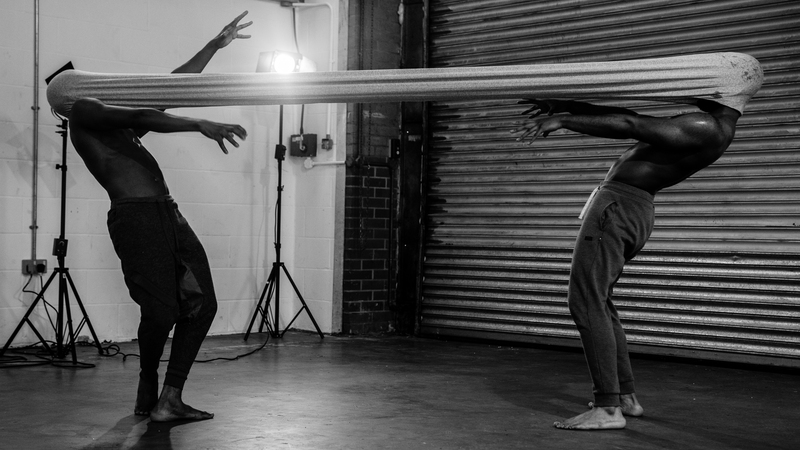 Drama Centre London graduate, Malaolu masterfully merges hip-hop and contemporary dance with physical theatre to dissect social and political issues, mental health, identity and masculinity, encouraging dialogue and encounter through movement psychology, inspired by Rudolf Laban’s 1950s teachings. Bold and provocative, tender and powerful, Figure is an experimental film about boys growing up without fathers and their quest to find themselves. It follows two young men (Nnabiko Ejimofor and Lanre Malaolu) in an endless physical and emotional dialogue, a mute monologue, where the painstaking precision of their movement and the captivating intensity of every step delve into manhood, emotional growth, loneliness, isolation and human resilience. ABOUT: Figure is an experimental dance film about boys growing up without their fathers. It explores early detachment from a father figure and it affects emotional growth and engagement with the world.